Submitted by dennis on Friday, January 29, 2016 - 4:30pm. The big downtown Mardi Gras block party has moved to the weekend, Saturday Feb 6, 2016 rather than the usual Fat Tuesday! 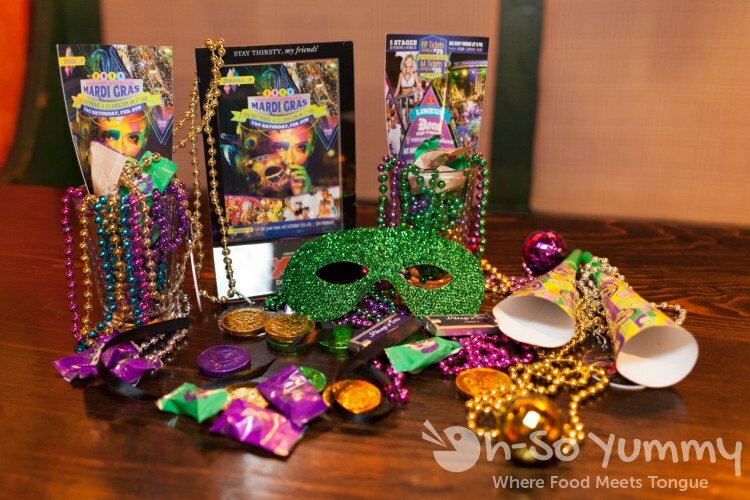 If you are interested in attending, the best deal is a Mardi Gras dinner package! The packages include $30 toward food/drink from a participating restaurant. Prices are $60 for general admission package or $90 for VIP ticket package. For example, the current cost of a GA ticket is $50, and for $10 more, you’ll basically be getting $20 free to spend on food/drink. Similarly the cost of a VIP ticket is $75 and for $15 more, you’ll get a free $15 toward your food/drink! The dinner package must be purchased online. You choose your restaurant when you purchase your tickets. Redeem your food/drink on the night of the party and have fun! 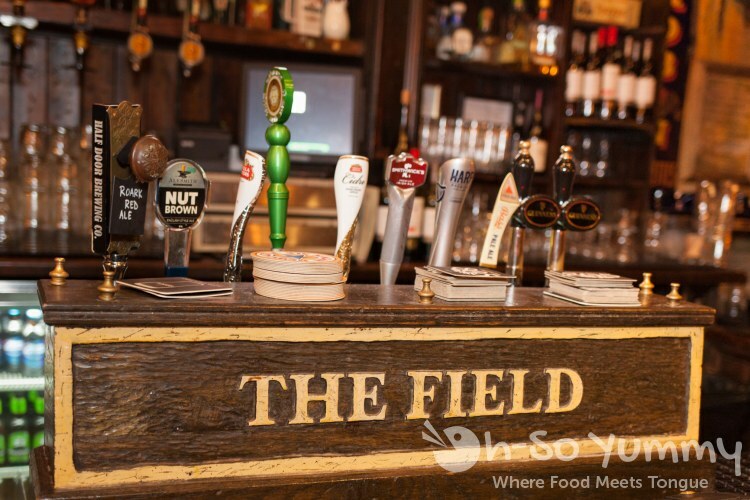 We were paired up for a food preview at The Field Irish Pub, located just outside the block party. You can hear the lively Irish music playing in the background while you get your grub/drink on. We went a little wild on the food last night for our preview. We ordered 3 sliders as starters for $10. Two of them were pretty unique on their own. One of them was the banger sausage mixed with beef and served with a fried egg on top. This one was amazing like a mini breakfast slider with great flavor. The second one was a lamb and beef mixed patty with blue cheese. It’s pretty hard to find a place that can balance the strength of blue cheese and this one does quite a good job. The lamb and beef flavor was tasty. The last slider was classic with red onions and tomatoes and a beef patty. Basic but still good. 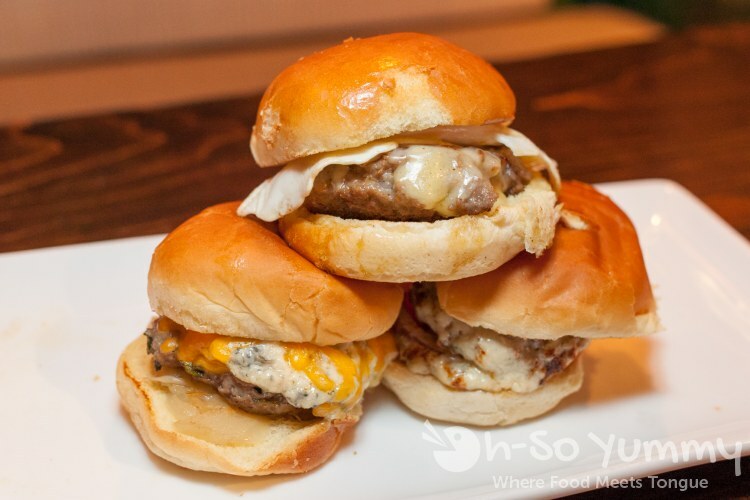 All of the sliders had decently thick patties that were juicy and tender. Sometimes we’d take a bite and juices were just running down the side of our hands and wrists. These things are packing! 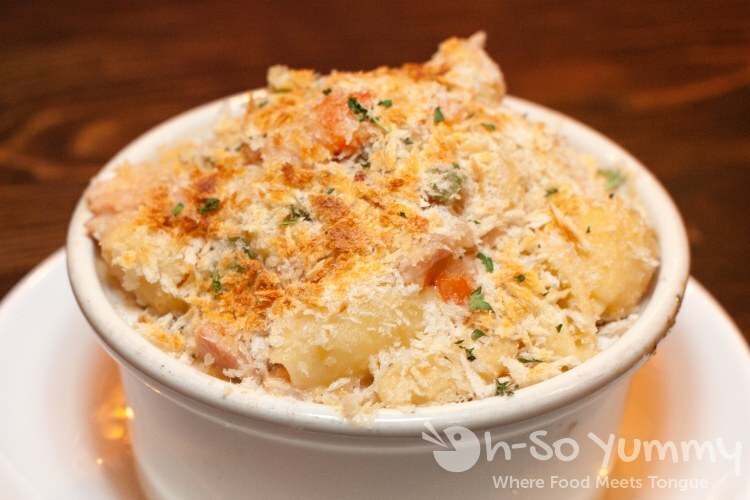 The second appetizer that we got was the Rasher Mac and Cheese. The Rasher is an Irish bacon which our waitress described as similar to Canadian bacon but not really. The bacon was not salty nor tangy. I think the flavor kind of got lost a little against the all the strong cheesiness. The mac and cheese itself was quite different. 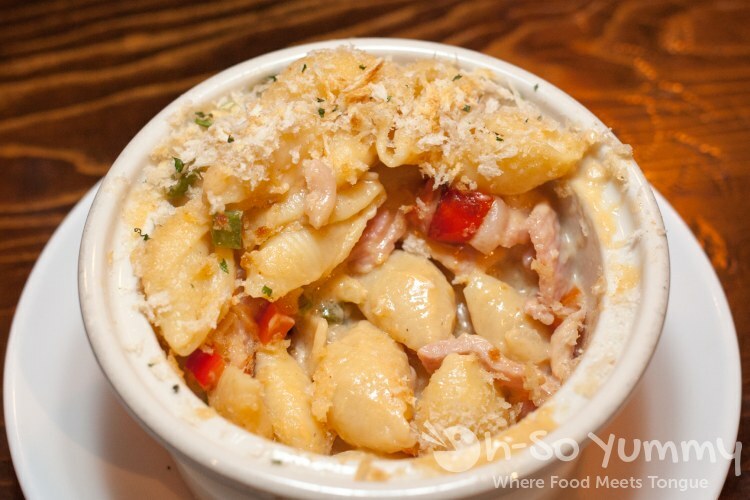 It uses pasta shells and is kind of cheesy. The bottom section had cheese that was melted and mixed around. It was light and slightly oily. The top part had a layer of cheese that was crispy and provided a nice play of texture for this appetizer. The other thing that was interesting was the bell pepper flavor in there. Even though our first courses were just appetizers, they both were quite a lot of food. You can easily order these, maybe a small side and call it a meal. The first item was the fish and chips which were highly recommended and what they are known for. Visually, the pieces of fish were pretty big. Sometimes when you go and order these at restaurants it can be deceiving because there’s a lot of breading and the fish ends up being small. Not at this place though! Even though it had a thick outer layer there was still a good chunk of fish inside. Tastewise we would have preferred it to be more crispy and a bit saltier. The fries were thick cut which I’m normally not a fan of. It’s hard for me to like it and these were okay for me. Lynn said it was alright. The rest of the plate was coleslaw and tartar sauce which were typical. 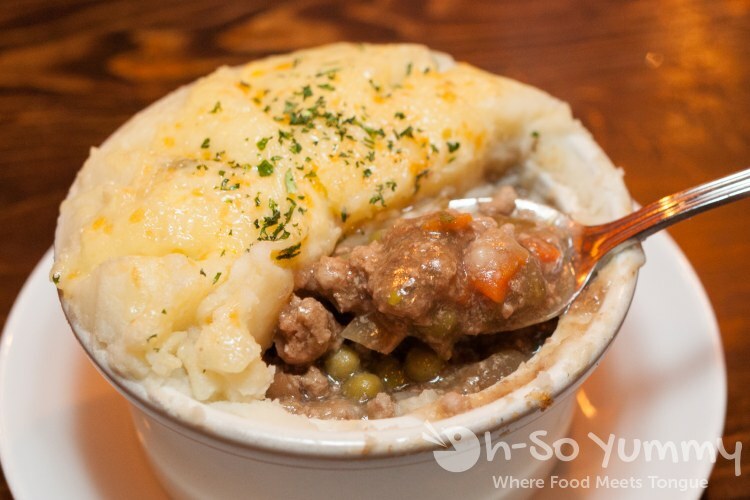 The Lamb Shepherd’s Pie immediately caught our eyes when we looked through the menu. When it came out there was a really thick mashed potato top layer which sealed all of the heat below in the stew. The moment we poked through there was an escape of steam coming out which, interestingly enough, had slightly deflated the mashed potatoes. 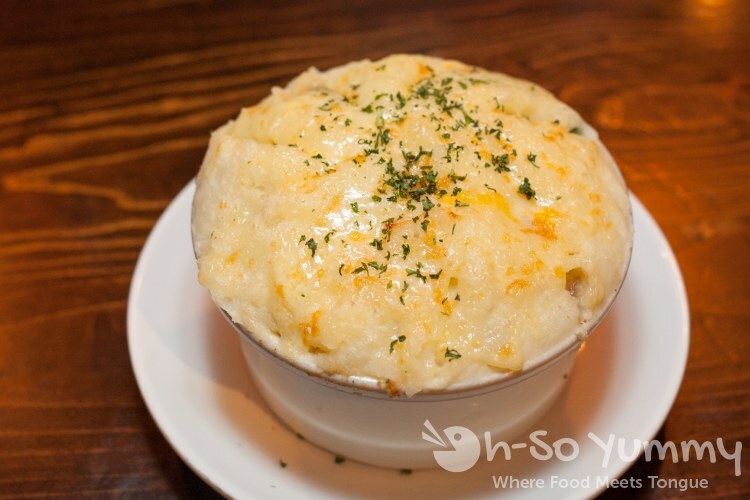 As we were eating we carefully tried to keep as much of the mashed potato on top in order to retain the heat. The lamb stew was great. Their regular shephards pie never fails to disappoint us and now that we've had it with lamb, we're more than pleased. The appetizers and entrees that we ordered tonight were hearty comfort foods. Our waitress said we would not leave hungry and they weren't kidding. We had to take half of the food home because we wanted to make sure we still had room left for dessert. 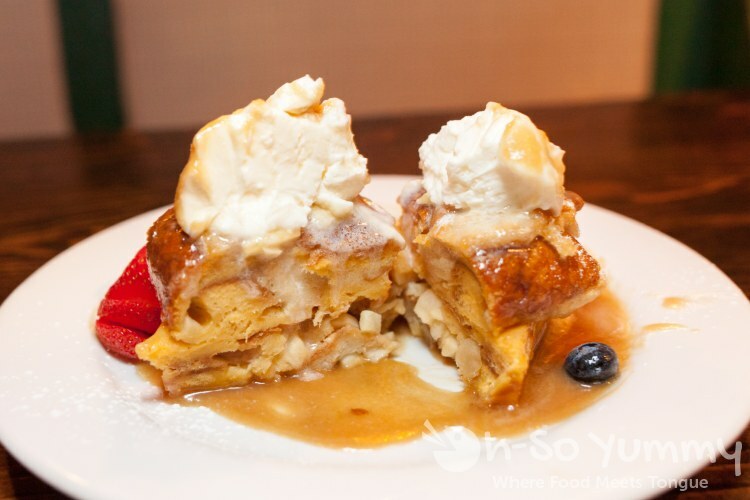 We ordered the bread pudding to finish off the night. When it came out looking as massive as it was, we felt unprepared because we didn't have much room left in our bellies. Looking at the outside you might think it's going to be sweet since it’s been drenched in sauce. But on the contrary, it was well controlled in my opinion. 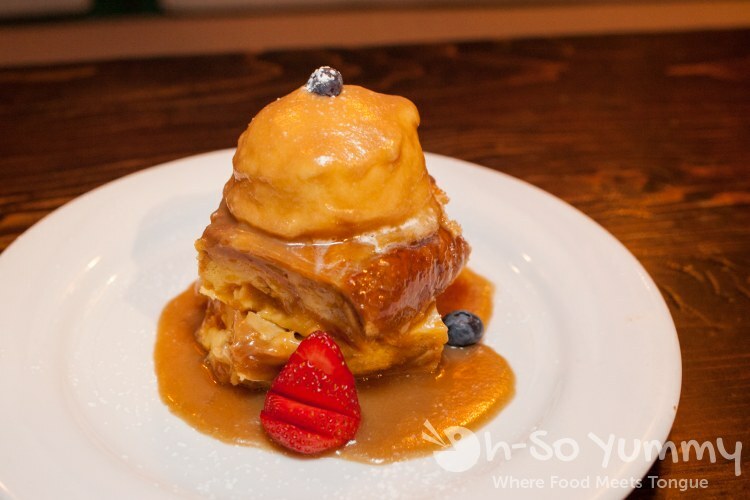 The bread pudding was phenomenal and I would have been okay if the sauce around it was a little more sweet. The best thing I like about this was actually the whipped cream at the top. It had a subtle caramel flavor that doesn’t leave you with a guilty conscious. I can imagine this whipped cream going well with so many different items including french toast or flan. 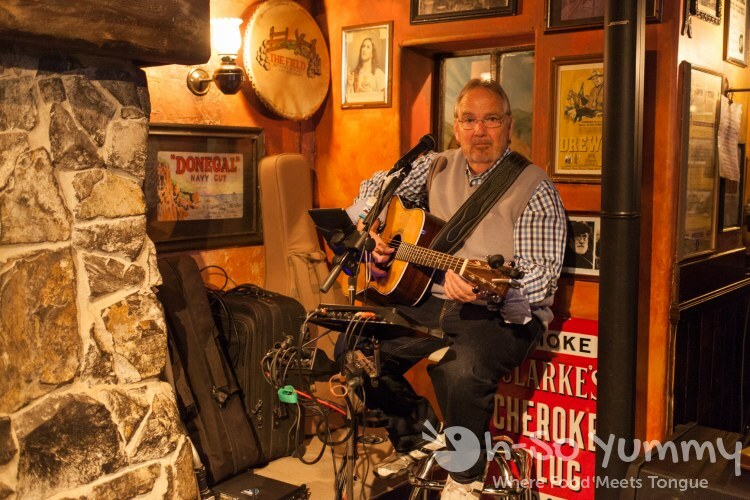 The restaurant felt lively with the Irish pub folksy-rock music. They even have a live band on Thursday nights. Unfortunately they were still setting up when we were just finishing our meal so we didn’t get a chance to listen. The dinner package is a great deal considering the current price of admission. And the $30 value going towards dinner will get you far if you eat at The Field. Considering the amount of food you get, we'd suggest maybe getting one entree for yourself, an appetizer to share, and drink. Disclaimer: We were provided tickets and discounts on the food but the opinions are strictly our own. 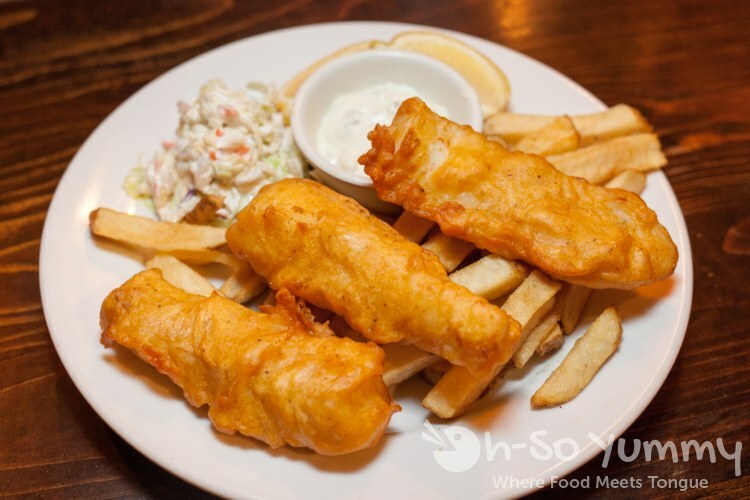 Halibut fish and chips sounds amazing!